The Bling Ring and Neck Tie will be far too subtle for some, but if you’re into adding textures and effects to augment your standard kit sound, they’re a fun, affordable addition. Great for adding textures to your rig. The Big Fat Snare Drum Original and Donut (along with the Snare-bourine) have caused a stir since their arrival by offering drummers everywhere the elusive, studio beefy punch of a super-dead snare without choking the drum in the way that other dampening products can. 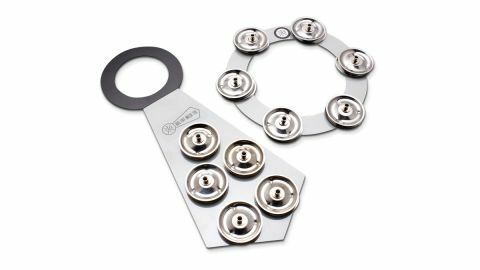 The latest offerings from BFSD are the Bling Ring and Neck Tie, with five and six pairs of tambourine jingles respectively, mounted to plastic film in different orientations. Now, this is by no means the first product designed to be placed on a cymbal. Indeed, these types of appendages are becoming common, just as repurposing the chain off your bathroom sink or getting over-zealous with a rivet gun have in the past. Given the shape of each, they have obvious go-to applications - the Bling Ring sitting flat on hi-hats and crashes, while the Neck Tie’s linear drop makes it intuitively useful for bigger cymbals. In practice, there are no rules. In fact, you don’t even have to stick to cymbals. We tried both products, with varying results, on the full gamut of hats, crashes, rides, chinas and splashes in our collection, as well as a couple of snares and even cowbells (don’t try cowbells). Our favourite sounds from the Bling Ring came from our thinner crash cymbal, where it added a pleasing layer of noise without killing the resonance of the crash like the Tie did. It also excelled on the ride bell, offering some added sizzle to bow hits and a cool burst of noise when we struck it with the shoulder of the stick. On the snare, the Bling Ring’s jingles are less noticeable than the dampening and added slapback as it leaps up and down - great if you can time it right! The Neck Tie turned our China into an intriguingly weird electronic cymbal, and added an almost vibraslap rattlesnake sound to our ride, particularly when struck hard with rods. The key here is experimentation: they spark your imagination, and they’re a leveller in that they could just as easily transform a broken junk cymbal into a high-end treasure.